The Repository Service manages connections to the repository from client applications. The Repository Service is a separate, multi-threaded process that retrieves, inserts, and updates metadata in the repository database tables. 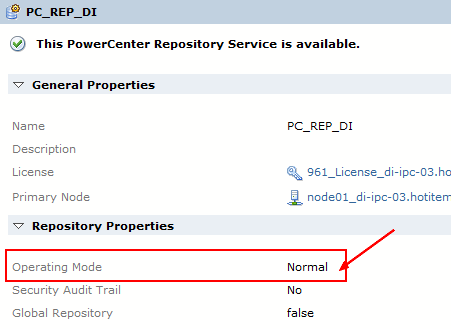 You install the Repository Service when you install PowerCenter - Services. After you install the PowerCenter Services, you can use the PowerCenter - Administration Console to manage the Repository Service. To switch a Repository Service from Normal to Exclusive mode and vice versa, you can use the infacmd command updateRepositoryService. And switch to normal mode using Operating Mode as Normal. PowerCenter - Client. Use the Designer and Workflow Manager to create and store mapping metadata and connection object information in the repository. Use the Workflow Monitor to retrieve workflow run status information and session logs written by the Integration Service. Use the Repository Manager to organize and secure metadata by creating folders, users, and groups. pmrep command line to perform repository metadata administration tasks and service-related functions. PowerCenter - Integration Service. When you start the Integration Service, it connects to the repository to schedule workflows. When you run a workflow, the Integration Service retrieves workflow task and mapping metadata from the repository. The Integration Service writes workflow status to the repository. PowerCenter - Web Services Hub. When you start the Web Services Hub, it connects to the repository to access web-enabled workflows. The Web Services Hub retrieves workflow task and mapping metadata from the repository and writes workflow status to the repository. Powercenter - Sap BW service. Listens for RFC requests from SAP NetWeaver BW and initiates workflows to extract from or load to SAP BW.